Apologies for any failures in nomenclature. I'm a mathematician who is making a foray into genetics for a masters thesis. Specifically, I'm generating artificial diploid genetic sequence data and phenotype data based on known epistatic interactions. I am familiar with the concept that having multiple copies of a single allele (e.g. one from each parent) can actually increase expression and thereby change the quantitative phenotype (at least in some cases?). Can this also happen with epistatic effects? For example, consider the case that locus 1 ($L_1$) and locus 2 ($L_2$) exhibit some positive interaction ($\beta$) on the trait ($Y$). $$E[Y]=\mu+\beta(L_1L_2)$$ If both chromosomes contain the allele in question at both loci, then does this individual exhibit more of a trait increase than if he only had one chromosome with the epistatic alleles? Can alleles interact epistatically even when they are present on different chromosomes? e.g. assume allele A at locus 1 interacts with allele B at locus 2. Individual has A at locus 1 and b at locus 2 on chromosome 1. He also has a at locus 1 and B at locus 2 on chromosome 2. Do A and B from the different chromosomes interact? My intuition is yes but I want verification. Question 1: The phenomena you describe in which it matters whether you have one or two copies of an allele (e.g., the AA phenotype being different than the Aa phenotype) are known as dominance effects. Dominance effects can interact with epistatic effects (in which the phenotypic effect of one locus depends on the genotype at the another locus). Question 2: Epistatically interacting loci need not be on the same chromosome. The loci discussed above provide a perfectly good example. 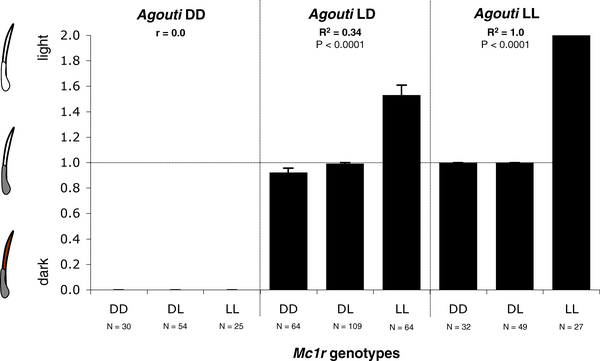 Mc1R is on chromosome 1, where as Agouti is on chromosome 7, yet they interact epistatically. Not the answer you're looking for? Browse other questions tagged genetics bioinformatics gene-expression chromosome quantitative-genetics or ask your own question.